It was 1953. Greene and John Sutro were in Edinburgh to see a play and were having drinks before the play when a group of Texans on a conducted tour of Norway and happened to be passing through Edinburgh. Two attractive young ladies from the group, Miss Crosby and Miss Alexander, ended up attending the play with Greene and Sutro and were shown around the city later in the evening by them. The next day the traveling Texans continued their tour. Greene and Sutro took a train back to London and on the way while drinking black velvets decided something must be done to help friendly Texans who were visiting England. As a joke they decided that they would found an Anglo-Texan Society and placed a letter in The Times soliciting members. The interest was suprising and thus the hoax became reality. At one point Sutro organized a meeting at the Denham studios. The air force brought over three steers from the Houston Fat Stock Show for the festivities. Over 1,500 Anglo-Texan members showed up. The American ambassador showed up and was redesignated by Texas Governor Allen Shivers as Texas ambassador to Great Brittain. A good time was had by all. The society was active until 1976. When John Sutro died his obituary mentioned the fact that he and Green had formed the Anglo-Texan Society to promote friendship between Texas and Brittain. 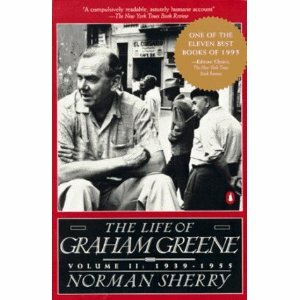 Sherry quotes Greene on the formation of the society with, “…what started this great event was the ignoble hilarity of two tipsy travellers when they plotted their little joke.” Who knew Graham Greene had a sense of humor? He died in 1991. Thank you, Max! Coming from you that is a real compliment! Thank you! Who would have thought Graham Greene (brooding, serious writer that he was) would have a sense of humor? We Texans are still proud of being our own country once! Cheers!